Well, the Japanese just keep releasing new figures! 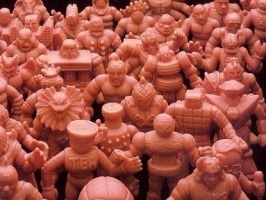 Now with Kinkeshi Premium Volume 4, the total number of new flesh figures including the new ones in Vending machines (which I’ll cover later) stands at a whopping 78 figures (75 single and 3 pairs) I really feel like I’m collecting M.U.S.C.L.E. all over again, waiting with anticipation for the next release. However, Volume 4 was easily the most expensive of the new series, setting me back over $100. I still think it’s worth it but damn it’s starting to burn my pocket, average price per figure is over $6 each. In volume 4 there has been a shift further away from the characters we are familiar with. This time there are only 8 figures from the original series, although 1, the Stereo Cassette King was never a M.U.S.C.L.E. figure – so really 7. 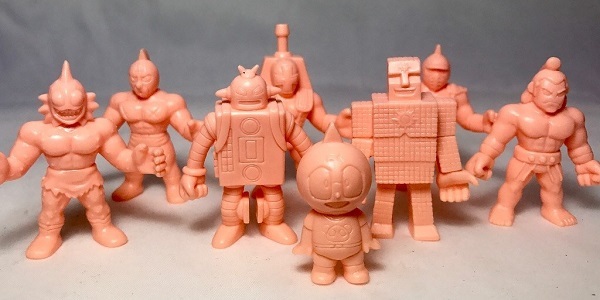 Another version of Kinnikuman which at this point isn’t needed. The variations between each Kinnkuman across the 4 volumes is minimal. The poses aren’t even different. Finally though we get 2 figures I’ve been waiting since these first arrived – Sunshine & Meat. The Meat figure is what you would expect – him in a t-shirt sporting a panda bear which is common in the Japanese cartoon. The Sunshine, although a nice figure, was a little disappointing to me. I was hoping for a larger, more chunkier version rather than one eerily similar to M.U.S.C.L.E. figure #39 which might actually be the Sunshine figure I like least. Still, a new Sunshine figure is a welcome addition. 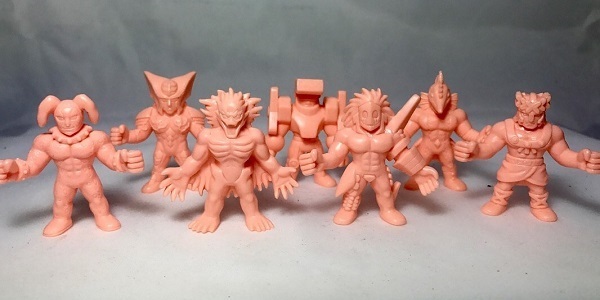 Next we get new and improved versions of Rikishiman/Wolfman, Kinnikuman Big Body, Leoparudon and Atlantis. I rate the Wolfman and Atlantis quite highly. Both are excellent sculpts and certainly an improvement over the original. The Big Body and Leoparudon figures however, were much better in the 1991 Kinkeshi series, in particular the Big Body. I was disappointed somewhat. We are now 4 series in and some of the figure choices have been unusual to say the least. I did expect to see King The Tons, Iwao, Kinkotsuman, Nakano San The Announcer and Prince Kamehame. Though maybe that is more hope on my part seeing they are some of my favorites! Now onto the new sculpts. There are 7. It’s really hard to describe these figures so you’re just going to have to look at the picture. 2 of the figures are exceptional in my opinion. The 2 of the centre of the photo. One looks like a devil of some kind and the other has a Jason Voorhees type mask on. Love those 2. Next to them is a guy that looks like Julius Caesar and behind him a figure with a long nose snout. To be honest I can’t even describe the other 3. Maybe because it’s late at night and it’s still 80 degrees here. I welcome new sculpts but these ones overall lack the punch of the previous series. I may one day come to love these new sculpts but for now, slow down on so many new ones and give me new figures of the ones I already know and love! This entry was posted on Monday, December 18th, 2017 and is filed under UofM News. You can follow any responses to this entry through RSS 2.0. You can skip to the end and leave a response. Pinging is currently not allowed. At first I thought you were overpaying with $100 for the Premium Vol. 4 set but then I remembered you reside in Australia right? so the shipping probably bumps up the price significantly. I reside in Germany and I bought mine from Mandarake two weeks ago for 6,000 yen + 1,440 yen shipping using AIR SP (for total of about $65). The Euro however does get me more bang for my buck.